The O’Jays are an American R&B group from Canton, Ohio, formed in 1958 and originally consisting of Eddie Levert (born June 16, 1942), Walter Williams (born August 25, 1943), William Powell (January 20, 1942 – May 26, 1977), Bobby Massey and Bill Isles. The O’Jays made their first chart appearance with “Lonely Drifter” in 1963, but reached their greatest level of success once Gamble & Huff, a team of producers and songwriters, signed them to their Philadelphia International label in 1972. With Gamble & Huff, the O’Jays (now a trio after the departure of Isles and Massey) emerged at the forefront of Philadelphia soul with “Back Stabbers” (1972), and topped the Billboard Hot 100 the following year with “Love Train”. Numerous other hits followed through the 1970s and into the 1980s and 1990s, and The O’Jays were inducted into the Vocal Group Hall of Fame in 2004, and The Rock and Roll Hall of Fame in 2005. They formed the group in Canton, Ohio in 1958 while attending Canton McKinley High School. Originally known as The Triumphs, and then The Mascots, the friends began recording with “Miracles” in 1961, which was a moderate hit in the Cleveland area. In 1963, they took the name “The O’Jays”, in tribute to Cleveland radio disc jockey Eddie O’Jay who was part of the powerful management team of Frankie Crocker, Herb Hamlett & Eddie O’Jay, (Toop, 1991). In 1963, The O’Jays released “Lonely Drifter,” their first national chart hit on the Billboard Hot 100, peaking at #93. Their debut album, released shortly thereafter was Comin’ Through. Throughout the 1960s, they continued to chart with minor hits such as “Lipstick Traces” (which they performed nationally on the ABC Television program, Shivaree), “Stand In For Love,” “Stand Tall,” “Let It All Out,” “I’ll Be Sweeter Tomorrow,” “Look Over Your Shoulder,” “Deeper In Love With You,” and “One Night Affair”. However, while they issued dozens of singles throughout the decade, they never once hit the US top 40 (although “Lipstick Traces” made it to #19 in Canada). On the R&B charts, The O’Jays were somewhat more prominent, but their only top 10 R&B single prior to 1972 was 1968’s “I’ll Be Sweeter Tomorrow”. In spite of their success as a touring group and on the R&B charts, the group had been considering quitting the music industry in 1972; around that same time original members Bill Isles and Bobby Massey departed, leaving the group a trio. The remaining three original members, Eddie Levert, William Powell,and Walter Williams, soldiered on and Gamble & Huff, a team of producers and songwriters with whom the O’Jays had been working for several years, signed them to their Philadelphia International label. Suddenly, The O’Jays’ fortunes changed and they finally scored with their first million-seller, “Back Stabbers”, from the album of the same name. This album produced several more hit singles, including “992 Arguments,” “Sunshine,” “Time To Get Down,” and the #1 pop smash, “Love Train”. During the remainder of the 1970s the O’Jays continued releasing hit singles, including “Put Your Hands Together” (Pop #10), “For the Love of Money” (Pop #9), “Give the People What They Want”, “Let Me Make Love To You”, “I Love Music” (Pop #5), “Livin’ for the Weekend”, “Message in Our Music” and “Darlin’ Darlin’ Baby (Sweet Tender Love)”. Original member William Powell died of cancer in 1977 at age 35. After adding Sammy Strain (born December 9, 1939) (of Little Anthony and the Imperials), the O’Jays continued recording, though with limited success. 1978’s “Use ta Be My Girl” was their final Top Five hit, though they continued placing songs on the R&B charts throughout the 1980s. The O’Jays success was not confined to the United States, as they also logged up nine hit singles in the United Kingdom between 1972 and 1983, including four tracks that reached the Top 20 in the UK Singles Chart. Their 1987 album, Let Me Touch You, was a breakthrough of sorts, and included the #1 R&B hit “Lovin’ You”. Though they continued charting on the R&B charts in the late 1980s and early 1990s, the O’Jays never again achieved pop success. In 1992, Sammy Strain left the group, and returned to the Imperials, to be replaced by Nathaniel Best, and later, by Eric Grant. Later in the 1990s, the group did little recording, though they remained a popular live draw. Their latest album was Imagination in 2004. 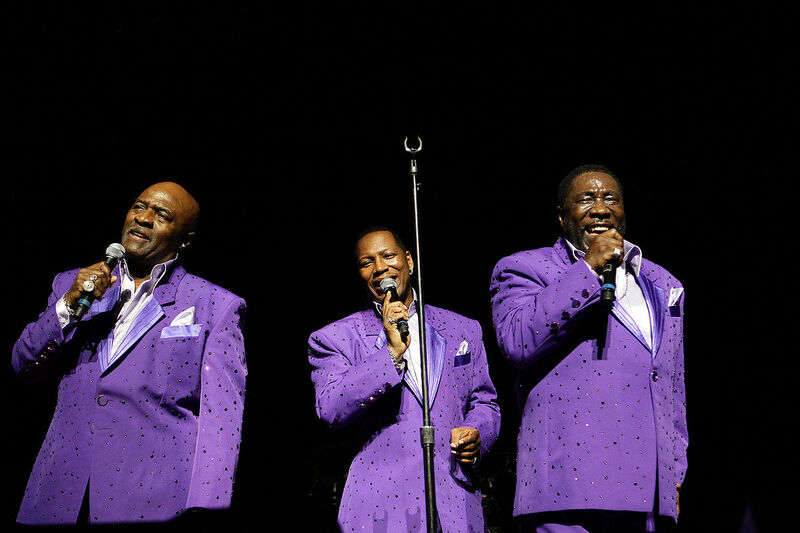 In 2005, the O’Jays were inducted into the Rock and Roll Hall of Fame. Original members Eddie Levert, Walter Williams, Bobby Massey and, posthumously, William Powell, were inducted. In a note of controversy, Sammy Strain was also inducted with the group, while original member Bill Isles was not. (Strain is one of the few artists in popular music history who is a double RRHOF inductee: with The O’Jays in 2005, and Little Anthony and the Imperials in 2009). In 2006, the O’Jays performed at the ESPY awards, hosted by Lance Armstrong. “For the Love of Money” is the theme song to the hit reality TV show The Apprentice, starring Donald Trump. On February 23, 2007, Radio-Canada’s website reported that Canadian Industry Minister, Jim Prentice, had used the song “For The Love of Money” without the group’s permission during a political event, a faux pas since Prentice is responsible for the application of the Copyright Act in Canada. Radio-Canada also reported that Prentice has since been contacted by the attorneys for both the O’Jays and Warner/Chappell Music. On June 28, 2009, at the 2009 BET Award Show in the Shrine Auditorium the O’Jays were honored with BET’s 2009 Life Time Achievement Award. Tevin Campbell, Trey Songz, Tyrese Gibson, and Johnny Gill performed a medley of the group’s songs, followed by the presentation of the award by Don Cornelius. The group reminisced, joked with the audience and accepted their award before performing renditions of their hit songs. On October 30, 2010, the group performed at Jon Stewart and Stephen Colbert’s Rally to Restore Sanity and/or Fear in Washington, D.C. In Cleveland, Ohio on August 17, 2013, The O’Jays were inducted into The Rhythm & Blues Hall of Fame. The O’Jays are also two-time Grammy Hall of Fame Inductees for their songs “Love Train” (inducted 2006) and “For the Love of Money” (inducted 2016).